The Federal Acquisition Regulation (FAR) contains the uniform policies and procedures for acquisitions by executive agencies of the federal government. The FAR is issued and maintained by the Department of Defense, the General Services Administration, and the National Aeronautics and Space Administration. This is the prime source of federal government contracting regulations. The January 2019 CCH Federal Acquisition Regulation reproduces the FAR and all amendments to the Federal Acquisition Regulation issued prior to January 1, 2019, along with an easy-to-use topical index. This is an essential resource for FAR requirements and FAR compliance. Citations for the rules amending each section of the regulation, including all contract clauses and provisions, are provided for every change issued since the initial text of the FAR was published in the Federal Register on September 19, 1983. If your business is directly subject to federal government contracting laws, this is the gold-standard reference for FAR guidelines and government contracting regulations. It is also an ideal resource for Federal Acquisition Regulation training. 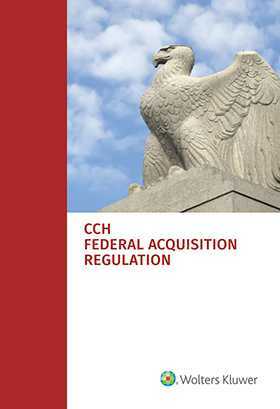 The January 2019 CCH Federal Acquisition Regulation contains all of the Federal Acquisition Circular, Final Rule, Interim Rule and Corrections made since January 1, 2019. How do I contract with the federal government? How do I ensure that I’m compliant with federal government contracting regulations? What are the special categories of contracting with the federal government? What are the general requirements for contracting with the federal government? What are federal government socioeconomic programs?